In the former Fons & Porter building on the south side of the Winterset Square, Piece Works Quilt Shop is stocked with thousands of bolts of fabric. It hosts events, welcomes quilters for meetings and classes, and has become a destination with the Iowa Quilt Museum just a few doors down. 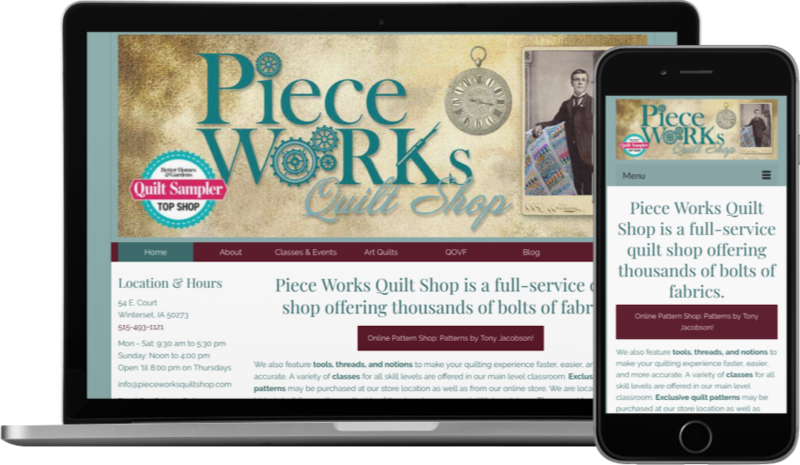 One special feature of this site is a store page that sells downloadable patterns online, created by the store’s manager, Tony Jacobson. This is done by integrating an application called Ecwid, which processes payments via several payment gateway options (in this case, PayPal). Tony is also a graphic designer, and he designed the header for this site.